Connect to your customers on Facebook and Twitter as easily as on traditional support channels like email, phone and web. 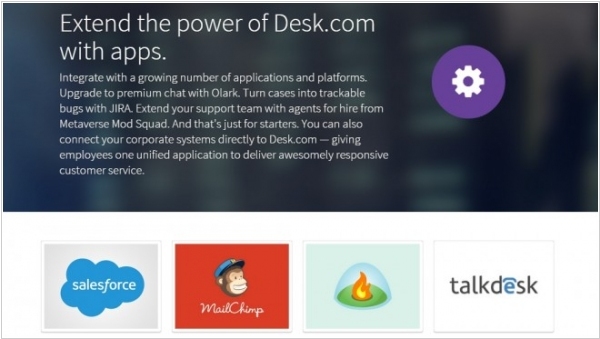 Desk.com organizes all of your support in one place so you can respond efficiently wherever your customers reach out. Salesforce has introduced an integrated product combining Salesforce IQ CRM and Desk.com customer service — its tools aimed at small businesses. By integrating the two, sales and service reps can get a full picture of the client across multiple channels, something that has previously only been available to much larger business using enterprise software that’s way out of reach of most small business owners. What this means is that sales reps working in SalesforceIQ can see notes and interactions that customer service had with the customer and CSRs working in Desk.com can see the buying history of the customer. 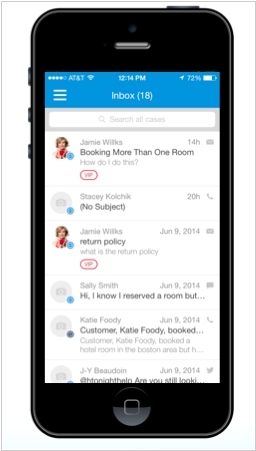 Salesforce updated its customer service product Desk.com. They have created a Desk.com app store called the App Hub that includes a bunch of partner apps chosen specifically for SMBs to give them a one-stop shop for the cloud applications they need – and they have created a way to integrate those apps directly into Desk.com. Among the partners are well known products such as Jira for issue tracking, MailChimp for email newsletter management, Olark to record desktop chats and more –including of course, the core Salesforce.com CRM product. The update includes access to all of these tools in one central place and makes use of what they are calling the ‘Desk.com Canvas’ to install these external packages and incorporate them into the Desk.com application. 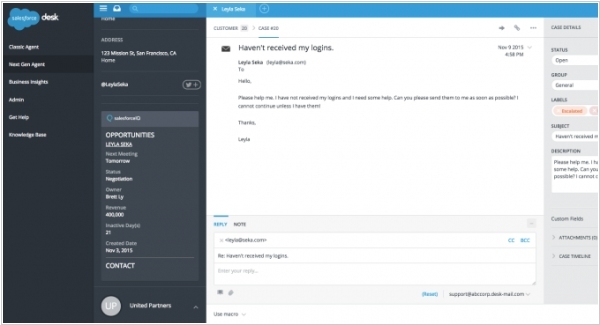 Salesforce's Desk.com platform is going visual — as in video support. The customer relationship management (CRM) giant just introduced a new Salesforce Desk.com Support Center, which includes video customer support. 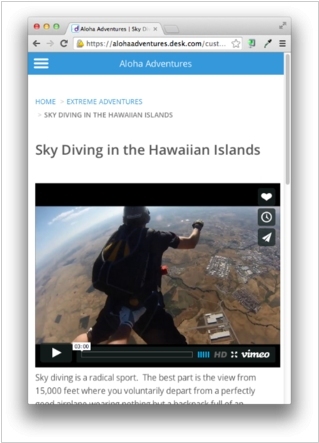 From now companies can provide rich video content directly in their support center and get detailed analytics on how that video content is performing so they can best optimize the way their customers interact with information in their help centers. The next generation video support is included at no additional charge with a Desk.com subscription. Pricing starts at $30 per month, per agent at Desk.com. Salesforce has updated its customer service app Desk.com with a new intelligent agent console and a mobile app and reporting engine among other enhancements for all-in-one automated customer service. The console can be personalized per agent to optimize productivity while rules, workflows and templates maintain the company’s brand integrity. The new reporting engine includes metrics and insights that allows managers to view comprehensive, real-time reports. Mobile app allows to add notes, update statuses and assign cases. In addition, Desk.com now includes 10 times more APIs to quickly connect data from other apps for a holistic view of the customer and an integration with Salesforce. The next generation Desk.com is generally available today with pricing starting at $30 per month, per agent. Salesforce keeps us happy with its new habit not to dissolve acquired startups in its core (large and expensive) CRM system but to use them for building simple and useful apps for small business. Last autumn Salesforce for $80 million acquired SaaS-Helpdesk service Assistly, made a face-lift, added mobile HTML5-client (for iPhone, iPad, Android), bought a cool domain - Desk.com and here is the new service! 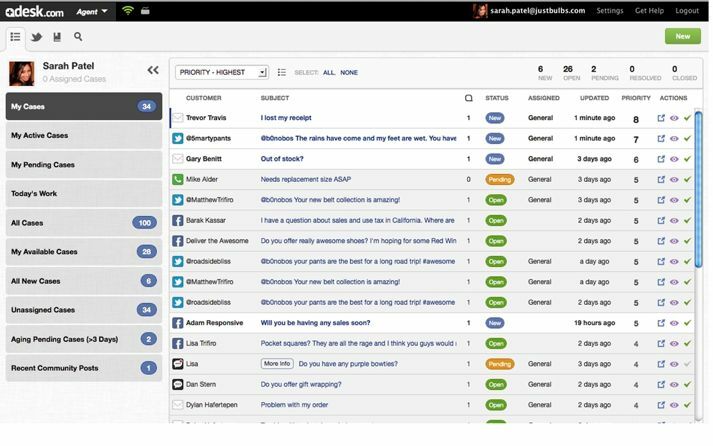 Desk.com allows you to organize client support by email, phone, via the customer portal on your the website, as well as in social networks. Any message in Facebook and Twitter can be converted into a ticket, assigned to support agent, processed in the support workflow and responded directly to the social network. And then you can publish it to the customer portal in order to reduce the number of same questions coming to support. Desk.com also preserved the original pricing of Assistly - with time-based billing. You can create users (support agents) and pay $1/hr. So if no requests come to the Helpdesk - you don't pay anything. The price for the full-time user - $49/month (e.g. it can be the customer service manager, who controls the whole process and studies analytical reports). Ana the single-user version of the service - is free!